. إن الخدمات التي يقدمها Seacrest Apartments تضمن للنزلاء إقامة مريحة. يقدم هذا الفندق العديد من الخدمات الكفيلة بإرضاء أكثر الضيوف تطلباً. بالإضافة لهذا,تتضمن كل غرف الضيوف مجموعة واسعة من وسائل الراحة . بعض الغرف توفر حتى تلفزيون بشاشة مسطحة, اتصال لاسلكي بالإنترنت, غرف لغير المدخنين, مكيف هواء, تدفئة لإرضاء أكثر الضيوف تطلباً. يقدم الفندق مجموعة واسعة من وسائل الراحة المتنوعة، كمثل: ساونا, حمام سباحة خارجي, حمام سباحة داخلي, ملعب تنس, كرة الطاولة. اكتشف مزيجاً ساحراً من الخدمة الاحترافية والخيارات الواسعة من وسائل الراحة والمتعة في Seacrest Apartments. Very nice apartment and location. Love the sea breeze and near to tram station & bus stop to all attractive places... Full facilities of apartment & kitchen.. Has modern and simple decoration. Love all of it very much and surely will return ! Near the beach, great view, very friendly staff. Even though the apartments aren't to be considered luxurious or new, they are more than appropriate for a holiday. Maintenance is good, amenities are adequate but most of all it's accross the beach, near shopping areas, restaurants, Waterworld,... While we did rent a car, it's walking distance to many things if you don't mind walking a bit. The staff was very friendly and helpful. We really enjoyed our week long stay. I had been searching for a number of weeks for a 2 bedroom self catering apartment that was near the beach, had good views and was wallet friendly. I did use a few other booking sites to try to find something to suit the 4 of us, 3 adults and a 3 year old but found many sites to be a bit deceptive Back to good ol' Agoda - trouble free bookings and you know exactly what you will pay when looking at something on the page. Back to Seacrest Apartments. I CAN'T RECOMMEND THEM HIGHLY ENOUGH. From the second I got to reception I knew I had made the right choice, the two managers at reception were friendly and welcoming, very helpful with questions and a delight to deal with. One worry I always have at some properties I have booked for such a good price is that the room might be second rate and not what I'd hope for. At The Seacrest Apartments I certainly didn't need to worry about this - we had a fantastic apartment, very well equipped with all we would need for the week (including a coffee plunger and sharp knives)- a must for the two chefs in the group. The bed was truly the best I have slept on, and the views over the ocean to the surf and sunrise was something you had to see to believe. As mentioned the ladies at reception were incredibly helpful - they will be able to help with getting tickets to any of the many attractions the Gold Coast has to offer and will happily provide great advice and information - true professionals which is a great plus in this day and age of "not so great service" where people are more interested in their phones than their guests. I know that the next time I go to the Gold Coast this will be the first place I will be making an enquiry. If you are considering the Seacrest Apartments - stop considering and book, you won't be disappointed. very useful apartment with cooking enable. its very windy so u dont need fan or air cond. staff are super friendly. attraction tickets are sold at the reception which the price are exactly as cheap as other travel agents price. car parking lots are very secure. great place for family vacation. The stay was good n the room was clear. Things that I do not like is the foldable bed is too soft & the spring is not evenly spread out. The lighting in the room is too dim & need to upgrage to brighter lighting. Location is good and easy to access to SP by driving 5mins. 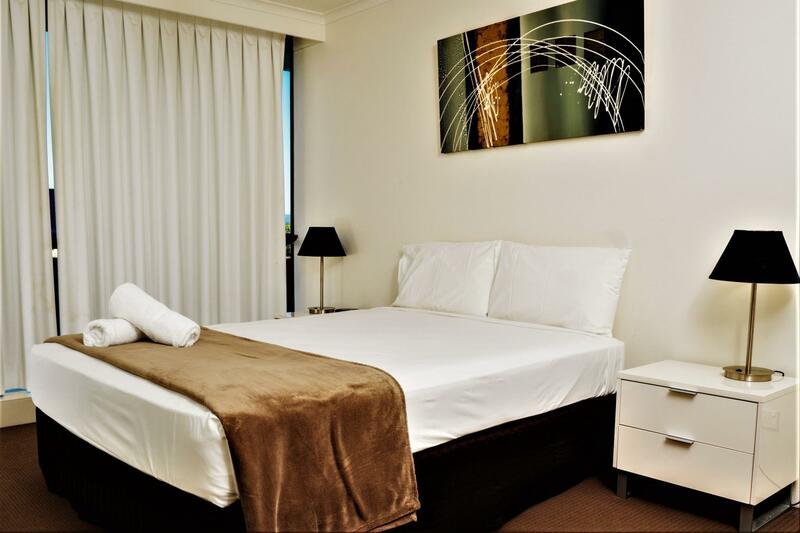 Conveniently located along Main Beach Parade within walking distance to shops at Surfers Paradise. Our families enjoyed our stays at Seacrest. We loved the location,services and welcoming hotel staffs. The games room keeps my kids occupied. When my wife left some documents behind, we made a call to the hotel from our country to see if the documents could be courier back to us. The hotel staff, Marie, promptly did so and we received the package 4 days later. This apartment is very spacious, clean and well-equipped kitchen. Its location is strategic, very near & convenient to tram and bus station. The manager is very helpful and friendly. would recommend this apartment to my friends in future. We arrived after hours and gained access reasonably easily. Good layout of apartment. Kitchen was well stocked with all necessary ancillary items. The view was awesome from every window. Sauna and pool facilities a bonus. We loved our stay and would quite happily return again. We love the Seacrest! My parents started taking me here when I was about 6 months old and I am now bringing my young family here. 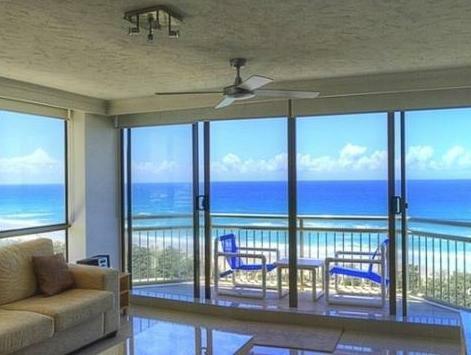 The location is great with good views of the beach, close to buses/tram and not too far of a walk to Cavill Ave. Our apartment had everything we needed - secure car park, kitchen, laundry, comfortable lounge, Foxtel etc. The kids loved the pool - both indoors & outside. We will definitely be back again and would recommend staying here. I loved the Seacrest apartments but what really stood out was the staff. They were all very helpful and went beyond their job to make sure we were happy. It is just a short walk to Cavill ave and only about 250m to the tram. I will definitely be staying here again. Good location to theme parks, food & beach. Clean environment & friendly staffs. My family had a wonderful stay in Seacrest Gold Coast. The unit was facing the sea and Nerang river at the back. We love the sunrise view every morning. The environment gave us a welcome home feel after our daily activities in Gold Coast. Just a few minutes drive to Australia Fair Shopping Centre for groceries and 10-15 minutes stroll along the beach towards Surfers Paradise. A top choice for family. My daughters and I had a very relaxing holiday at Seacrest Apartments. All the rooms were spacious and set out well for our requirements. The views from our apartment was amazing. The rooms were very clean and tidy, but if I have to be overly fussy, some areas (mainly underneath chairs, beds etc could have been a bit better. Overall we were impressed, thank you and we would definitely stay there again and recommend it to all our friends and work colleagues. Our stay was brilliant. Seacrest was ideal for my family. 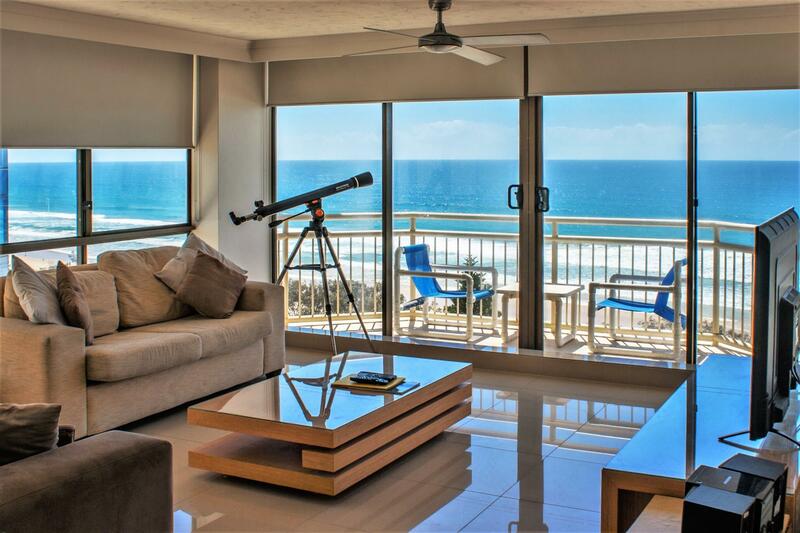 The location is perfect for us, opposite the beach (patrolled by life savers) and awesome views. Close to what we needed some small convienance shops round the corner, 15-20 min walk along the beach to main shopping area. Apartment was perfect for us, self contained, with everything we needed. Space enough for all 4 of us (youngest child is 11, so not little!!). Staff were lovely, friendly and always welcoming. Amenities were clean and accessible. Very relaxing. The staff at Seacrest Apartment was really friendly & helpful. The apartment was clean and well equipped with the necessary needs. The playroom and indoor pool kept my boys entertained. Overall it was an enjoyable and pleasant stay at Seacrest Apartment. The bedrooms and toilets were very clean and well furnished, only thing is the bed is too soft. The kitchen was well equipped with the clean utensils and cooking wares. Plus points were the playroom and the indoor pool which kept my boys entertained the whole evening! The common bathroom door can't be locked. I enquired and were told that it was to prevent accidental self locking. We were told that there were incidents of accidental locking which required the intervention of the fire department. However the main bedroom bathroom door could be locked. Rather odd as a child can also be locked in. This is an issue on modesty. Hope the Management will take note of this. We were disappointed with staying at low floor although we paid for ocean view. Nevertheless being low floor means easy access to swimming pool. The kitchen is well equipped. Room is bright. Property and car park and lift are old and outdated. No room service. So need to bring your own shampoo and clear rubbish too. Be prepared. We were given a low floor unit facing the pool, it can be little noisy with swimmers. Our friends were given the top floor with a majestic view of the sea (we drew lots haha). The living room aircon is very powerful and cold, although there's no airconditioning in the rooms. Its still not an issue as the night is cooling. We arent so sure when the real summer kicks in. Frontdesk is friendly. Location is off surfers paradise, hence quite away from the noises. We are pleased with Seacrest on the whole, clean toilets and kitchens. Apartment managers are friendly, helpful & always ready to assist your queries . the apartment location & beachfront view overlooking the sea was fantastic . facilities around the apartment was very good & the apartment utensils, lcd tv, dvd , minicompo system , conditions of apartment was good. managers trudy went all the way to open the garage gate for us & david was helpful in assisting us with the convection oven. overall, we had a great & wonderful stay there.